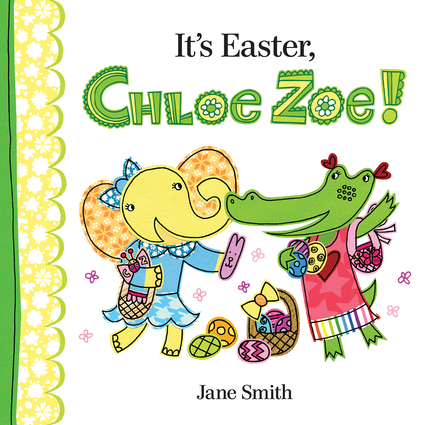 Chloe Zoe and her friends are going to the big Easter egg hunt! Chloe Zoe wants to find the sparkling golden egg with a special prize inside! Everyone's Easter baskets are filling up except Mary Margaret's. So Chloe Zoe and friends work together to help fill her basket. But when Mary Margaret finds the sparkling golden egg, Chloe is upset! What will the trio find when they crack the egg open? Jane Smith earned her BFA in illustration from Columbus College of Art & Design. Upon graduation, she worked as an art director for a children’s novelty book publisher in Los Angeles. Jane currently creates artwork for a variety of publishing and licensing clients at her beach bungalow in California, where she lives with her husband and daughter.Jane Smith earned her BFA in illustration from Columbus College of Art & Design. Upon graduation, she worked as an art director for a children’s novelty book publisher in Los Angeles. Jane currently creates artwork for a variety of publishing and licensing clients at her beach bungalow in California, where she lives with her husband and daughter.